With cooler weather and the beginning of November finally here, it is time to start planning for the holidays. Need a practical gift idea? It isn’t always easy—especially on a budget—to come up with gifts for everyone on your list. The cocoa recipe below is great to give (and receive!). It is fun to customize the recipe by adding your favorite spices—be sure to make extra to enjoy with your family too. This can be easily packaged in jars, cans, tins, or even in plastic bags. 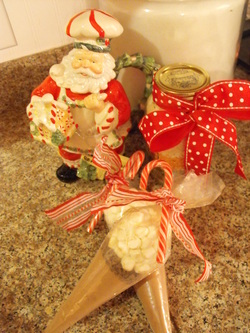 The cocoa in the photo was packaged using plastic pastry bags (like you use to pipe frosting) and was layered with chocolate chips and marshmallows for embellishment. Combine and mix all ingredients. Store in an airtight container. To make, add 1 heaping tablespoon cocoa mix per ½ cup hot milk; stir with a whisk to dissolve. Serve with marshmallows or whipped cream. Variations: To make a more standard chocolate flavor, omit the cinnamon and cayenne pepper. Instead, add a peppermint stick to stir with or create your own flavor combination by using other spices: ginger, cardamom.